Wooden mummy ticket. The ticket is roughly rectangular with one of the shorter sides tapering. This projection is pierced, and a fragment of cord passing through this hole is preserved. 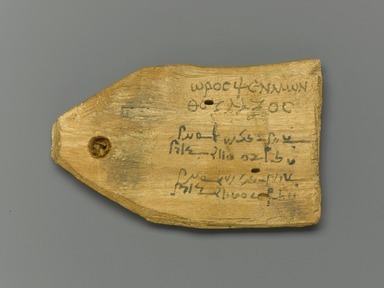 The piece is inscribed on one of the large surfaces with a text in Greek and Demotic. The inscription reads: “Horos, son of Psenmonthes, stone cutter. Osiris, Hor son of Psenmonth, the hw, the Prophet of Imhotep”. Condition: Good.